Firing system. Everything looked to be in order. At first glance, everything seemed to be good with no obvious fault in the firing system. 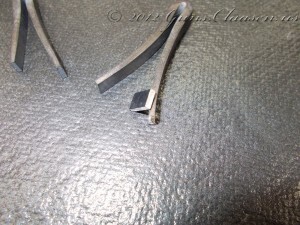 The stock bolt showed signs of cross threading. 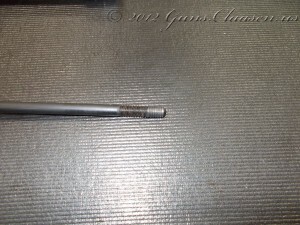 The stock bolt showed signs of cross threading. 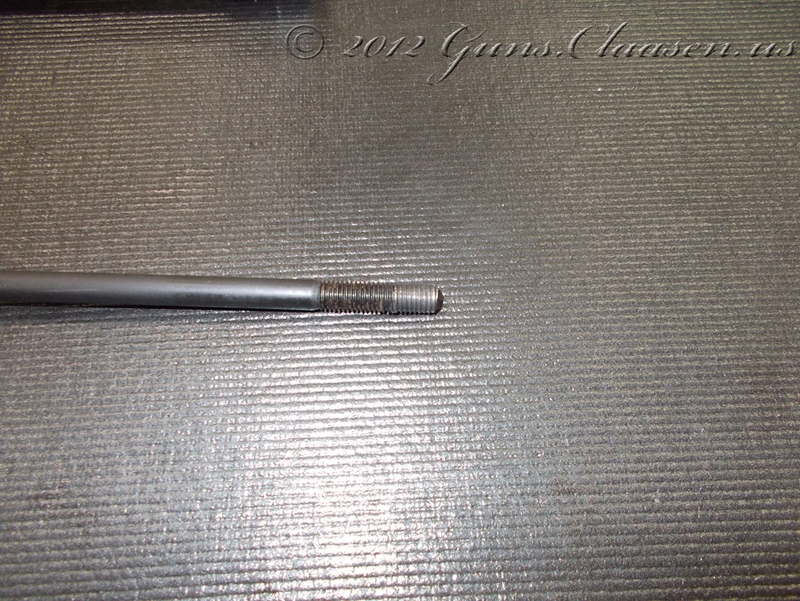 This was repaired as a loose stock can lead to damage on recoil. 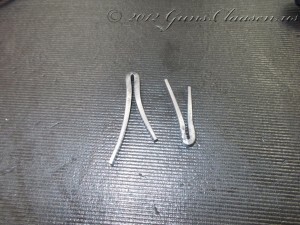 On disassembly of the firing system, I did find that the screw holding the safety detent spring was not tightened properly. Looking at the operation of the firearm, it is possible that this could cause an intermittent problem when firing the second barrel. I tightened the screw, cleaned the firearm, and test fired it with no malfunctions. 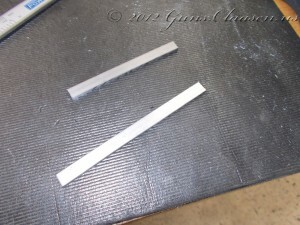 One of the skills a gunsmith needs to have is to know how to make replacement parts for firearms. 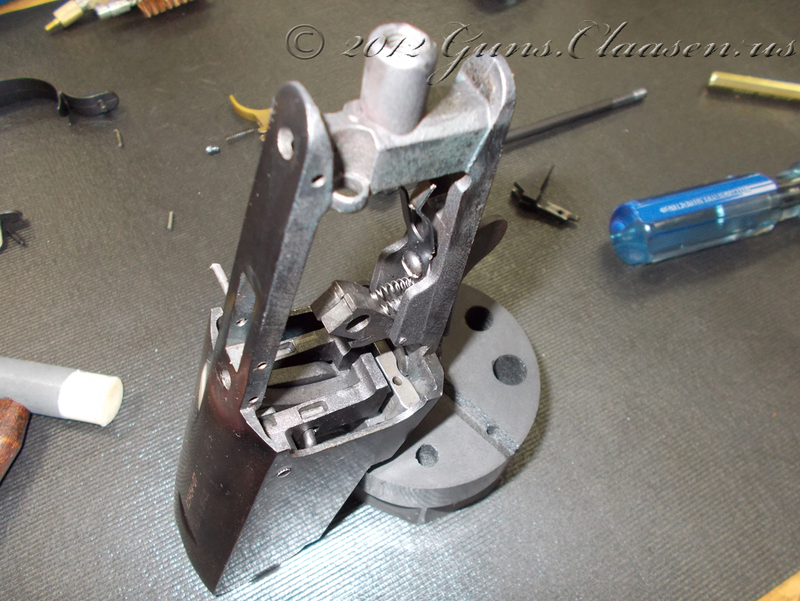 Very often, the repair is on a firearm that does not have replacement parts available. 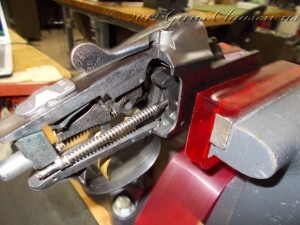 The requirement for this course is to make a mainspring and a bolt spring for an L. C. Smith shotgun. 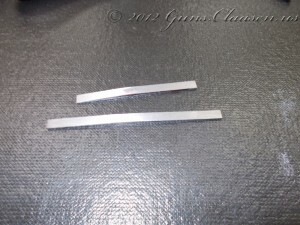 The springs are made from blank spring stock and cut to size. The next step is to shape the springs. Once the desired shape for the springs is achieved, the springs are heated and bent to the correct shape. Notice the curves in the legs of the springs. 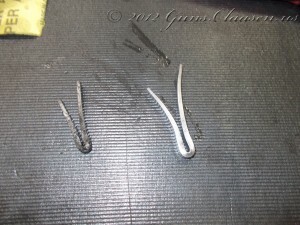 The springs are then cleaned and tempered in our oven. 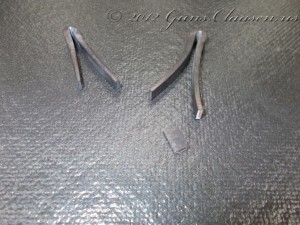 This can also be done by using any heat source, but care has to be taken not to heat the spring too much as it will become brittle and be prone to breaking. After coming out of the oven (and cooled down) the springs can be tested. This is merely done by compressing them in a vice. If the do not break and return to their original shape, all is fine. 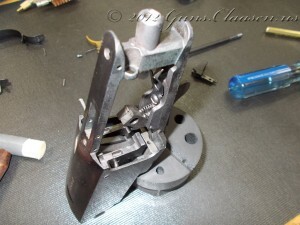 Mine passed the test, even though one of the legs on the mainspring broke. After discussing it with the instructor, we felt that it was most likely due to a small stress fracture in the spring material. 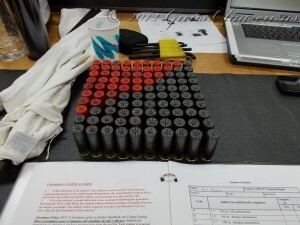 For the reloading portion of this class, I chose to do 100 rounds of 12ga shotshell, 100 rounds of .40 S&W (pistol) and 100 rounds of .308 Winchester (rifle). I have reloaded pistol and rifle ammunition before so the only new experience was doing the shotgun ammunition. There is a lot of information available about reloading so I am not going into a lot of detail here. For the shotshell, I chose a fairly low charge as I have older shotguns. I used previously fired AA plastic hulls, WAA12SL wads and a 1 oz. of lead Shot. 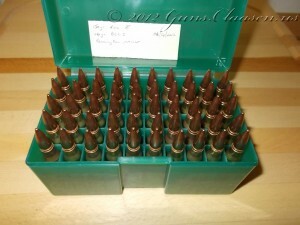 The powder used was 15.8 grains of Clays and the primers CCI 209SC. According to Hodgdon’s reloading data this should generate 7,500 PSI and a velocity of 1125 ft/s. 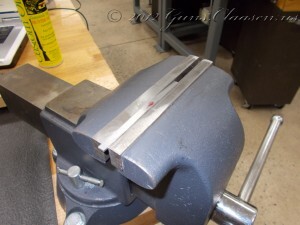 I used a MEC progressive press. 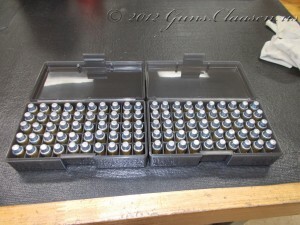 A change for me in the pistol ammunition was the use of cast lead bullets instead of jacketed bullets. The load date came from the Lee reloading manual. I used 6.2 grains of Unique powder, and a 155 grain bullet which should give a velocity of 1021 ft/s. 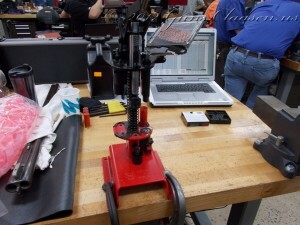 I used my own Lee single stage reloading press. 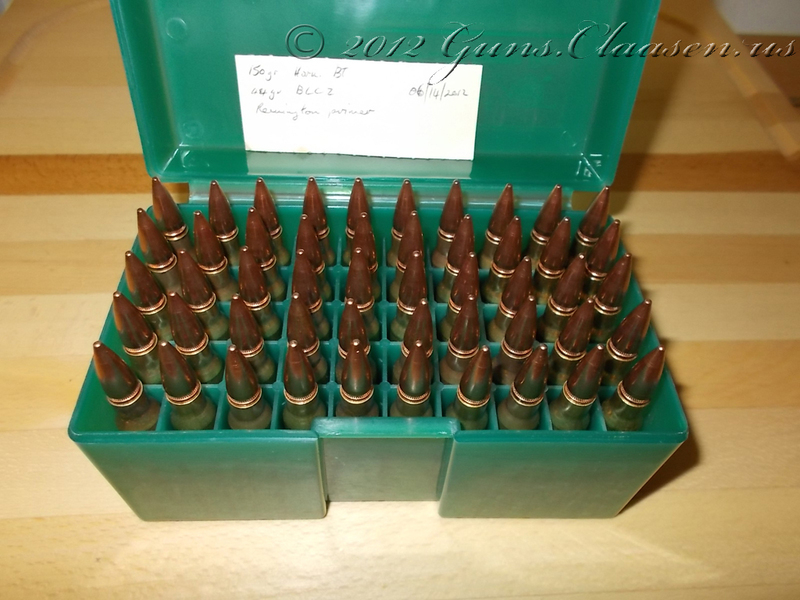 For the .308, I used 44 grains of Hodgdon BL-C2, Remington primers and Hornady 150 BT (Boat Tail) FMJ (Full Metal Jacket) bullets. 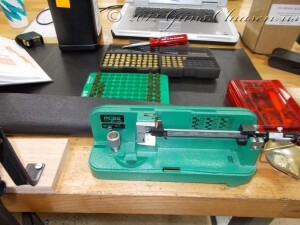 Again, I used my Lee single stage press to do all the reloading. I did shoot samples from all of these and did not have any issues with any of them.